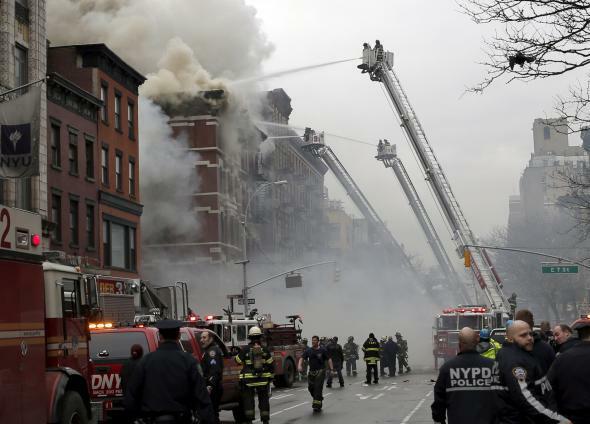 New York City explosion causes fire in East Village. Firefighters fight a fire near where a residential apartment building collapsed and was engulfed in flames in New York City’s East Village neighborhood March 26, 2015. An explosion in New York City’s East Village Thursday caused a five-story apartment building to catch fire and collapse causing at least a dozen injuries, several of them critical. The New York Fire Department said early reports indicate the fire was caused by a gas explosion and some 250 firefighters were actively fighting the seven alarm fire. CNN is reporting that several people may be trapped inside the burning building. As firefighters battled the blaze, thick smoke clouded the city skyline. Portions of the neighborhood, near New York University, have been evacuated.